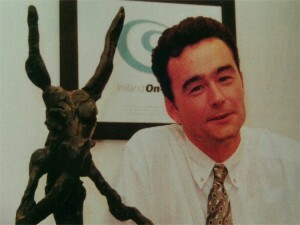 It was 20 years ago – 15 May 1992 – that I opened the doors at Ireland On-Line. Operating out of my house in Galway, and with only a credit card as working capital, it was the culmination of 9 months of dreaming, planning and learning, and the start of a fantastic adventure. The aim was as simple as the name suggests – I wanted to put Ireland online. To bring the World to Ireland, and Ireland to the World. The Internet was as yet unheard of except within the hallowed halls of academia, but I was convinced that this global network had the potential to transform this country, and would ultimately affect every aspect of our lives and businesses, and allow a new generation of Irish to remain in Ireland yet enjoy the benefits of a global economy and opportunity. Now, looking back 20 years later, I am amazed at how much of what I predicted and imagined has come to pass. We live in an Ireland today which, although beset by some short-term setbacks, has been transformed in terms of our ability to transcend our borders and small population. Our opportunities are global, and our reach infinite. With Ireland On-Line, I – at first alone and later with others – had the honour of leading and shaping an entirely new industry. It was all uncharted territory. A blank slate. The only rule: there were no rules. The only certainty was continuous change. We made it up as we went along, but we did so with a conviction that this was important and long lasting and so wanted to do it right. Our belief in what we were doing, and that it was bigger than any of us, kept us going and pushing forward when few others shared our vision. Over the next seven years, IOL grew from a single employee to over 120, and remained the largest ISP in the country, maintaining over 60% market share despite ferocious competition from larger, better funded rivals. We achieved this through the strength of our team, and a shared determination to succeed. It was an amazing, magical and exhilarating time and I am immensely grateful to have been a part of it, and to have shared it with the incredible people who made IOL what it was. While the brand Ireland On-Line as been neglected and allowed to wither by the to-and-fro of the corporate world, it leaves a legacy of which I am immensely proud. This entry was posted in Ireland On-Line, Technology and tagged Internet in Ireland, IOL, Ireland On-Line. Bookmark the permalink. 21 Responses to It Was 20 Years Ago Today…..
Barry – Exceptionally well written article. If you ever give up the day job you should become a writer ! You are indeed a true pioneer and visionary. Not only that, but you followed through on your vision and created in “IOL”, something so very unique at the time, that it changed the lives of everyone who encountered, “The IOL/internet experience” for the very first time. Now twenty years later your vision has become a reality and the internet is now completely integrated into every aspect of our daily lives. Such a short time. Its incredible to think that my sixteen year old daughter can’t even imagine a world without the internet. For me that puts it all into perspective. That is some legacy Mr. Flanagan. You can stand very proud of that singular achievement !!. I’m still having trouble with that V32bis modem, can you talk me thru the winsocket setup? Sorry, but from the sound of the negotiation, that is only a v32 you’ve got there! That was when Microsoft won the Browser War, at least in Ireland, and they hadn’t even released IE yet! Still, that first Netscape disk was a masterpiece. Hi Barry – Thanks for the memories, can’t believe 20 years have passed. It was thanks to IOL that my first business (Data Solutions) became very successful selling modems to get businesses connected to the internet – The good old US Robotics Sportster! Both you and Colm Grealy deserve full credit for bringing the Internet to Ireland. Paul we were told not to support anyone using a US Robotics Sportster over at AOL tech support in eastpoint back in the day. I think it was the only modem we were told not to support. It certainly brings back a lot of memories. Most people today don’t realise what the online business was like in Ireland back then and how it was a constant battle against leased line charges and per minute call charges just to survive. But the web and the internet survived in Ireland mainly due to the foresight of people like yourself and Colm and the people in IOL. And for that, Ireland should be eternally grateful. Cheers John. I still remember our late night conversations when we were both up all hours tending our online endeavours! Hi Barry – many happy returns. Eudora Lite and Trumpet Winsock brought it all back. You and Colm were indeed pioneers. rte.ie. iol.ie/~2fm was a classic from Barry Lang’s design school I recall. A proper visionary forward looking company that really did bring t’internet to Ireland. Cannot believe it’s 20 years. Congrats & thanks for the memories. Writing this on an iPhone which my 21 year old self would have fainted with excitement at… Better than a Wang 386 running 3.11 and a 14.4 modem! 2fm was such a great partnership for us. It worked so well for both parties. You guys were the first to really see the potential of radio linked with online, and for us you were blasting out the @iol.ie addresses all day. Congratulations dude! That’s a great story to have been at the heart of starting – and well told in your post. When you see the scale of Google, Facebook, eBay and Paypal’s Irish operations these days it’s hard to remember just how new it all is and how much excitement there was 20 years ago that we finally had an actual ISP in Ireland. Congratulations indeed! And great days despite the late nights! On returning from a trip to NY in ’94 I was convinced insurance on the Internet was going to be big; didn’t find IOL at first (you couldn’t just Google “Irish ISPs” in those days) so signed up with AOL first before finding Barry and the boys and becoming an IOL customer and launching insure.ie as a concept site. Only threw out the Netscape and Eudora diskettes about a year ago! They did admit “there were a couple of issues with it” when it came back. Colm Grealy used to say that between us we knew every one of our first 5,000 customers by name. There was some truth in that! Good article Barry. Sounds like it was an exciting venture. I’m sure you’re still churning out the ideas. Hey Barry. Wow 20 years. I remember my first year with Ireland On-Line in 1997. What growth in 5 years. We moved out of Amiens Street to Andrews Street post office. It’s a time etched in my fond memory banks. We even had Halley’s comet that year too. WOW, 20 years! I have a lot to thank you for. I started working with IOL 13 years ago, and I’m still employed, now by BT/Osmosoft. IOL launched my tech career and set in stone the direction I’d follow. Thanks Barry for setting up the company. Memories.